When your Feet don’t Touch the Ground! These past six weeks I feel as though my feet have barely touched the ground! Hence the reason for this latest post which I had originally intended on writing two weeks ago! 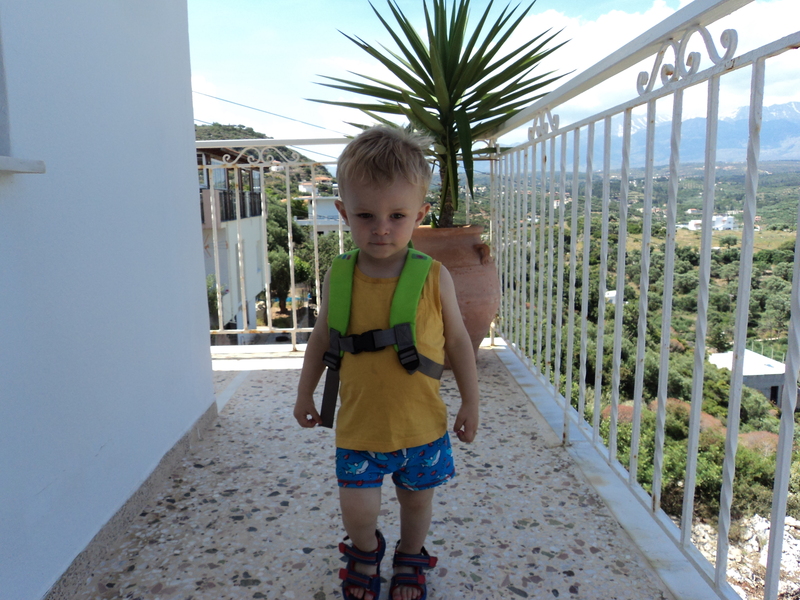 On my balcony on their first day – Ralph is all ready for his first day on the beach! On Tuesday 23rd May Emma and Ralph came to stay with me for a week and what a wonderful week it was! 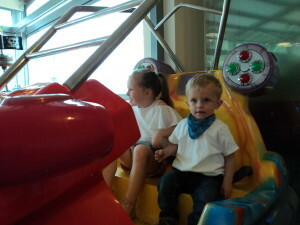 They arrived in the evening and we ate dinner in Almyrida directly from the airport. Ralph was happily chatting away in his own little language all the way back. I switched my selling days so that we could all go to the beach on the first two days of their holiday. I was dying to see Ralph’s reaction to the sea and the sand. Ralph loves water anyway but he was fascinated with the sand! Ralph with his bucket and spades and a little friend! Armed with two mini spades and a bucket, he was happily amused for hours, paddling in the sea and running all over the place, tripping up over his own feet, getting straight up and then off he was again! He never stops wandering off to see what he can find next. Ralph is mad about bikes – mostly motorbikes but actually – all bikes and it’s his favourite word! Here on Crete they are everywhere and so Ralph was in his element! On the Friday I had my usual selling day at the edge of the beach in Almyrida. Emma’s close friend Hazel and her daughter, Isabelle (who was bridesmaid at Emma and Ash’s wedding) arrived to spend the last 4 days of the holiday with us and was staying at the Almyrida Beach Resort. Isabelle and Ralph get on so well together and it was lovely to watch them playing – or rather, to see Isabelle forever trying to keep up with Ralph! 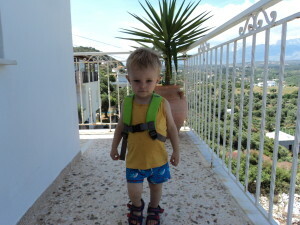 As Ralph’s Yia yia, I am having to stop myself from writing about him, extolling all his many little virtues, when he is only 18 months old! 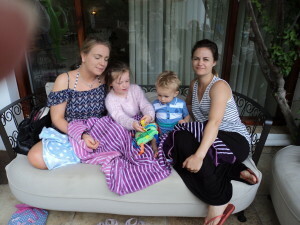 With Hazel & Isabelle, poolside of Almyrida Beach Resort – on one of those ‘dodgy weather’ days! Sadly the weather here on my little part of Crete took a downturn for those last four days. We had lots of cloud and it was chilly in the evenings when we ate out. I actually had to pack up early that Friday, just before the heavens opened – damn! Not a good ‘welcome’ for Hazel and Isabelle! Saturday, Sunday and Monday all ended up being mostly cloudy, with a few sunny spells and more rain interspersed. 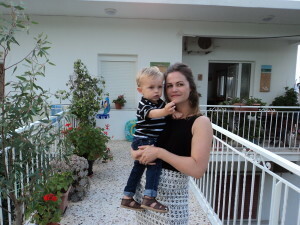 But we made the most of things and were still able to spend quality time around the poolside of the Almyrida Beach Resort, even playing Rummikub when Ralph was asleep. Inside the small Arcade in Almyrida – because it’s chucking it down outside! Naturally, it was a wonderful week spent with my gorgeous Grandson and I made sure to take heaps of photos and some video footage that I can watch whenever I’m missing him. It was so difficult to choose which photos of Ralph to include in this post – because there were so many. So this post is entirely dedicated to photos of Ralph! I was totally unprepared for the massive wrench I felt on parting with Emma and Ralph at the airport. I cried all the drive home and when I walked into the house and first saw the highchair with some jam on toast still sitting on the tray; and then the cot set-up in my art studio – it set me off all over again! The following day I was back by the beach and working on my seashell mosaic art. But as soon as I’d set up my stall and display, I called Steve to ask him to collect the car seat that Ralph had used and that Steve had so kindly lent me. Having the seat in my car was also making me well up and get teary! Life carries on and I had much catching up to do after Emma and Ralph’s visit. I have had some custom work to start and have been prepping up designs that I can work on whilst I’m selling. The weather has been unsettled and two or three times I have been rained off! Not good for business! Thankfully, things have now settled down to our more ‘usual for the season’ weather – hot, sunny and windy! Trying to coax Ralph into the sea at Almyrida’s small beach. You can actually see my house on the hill! If work hasn’t been taking up all my time – my social life has recently taken a whirl! I’ve been to quite a few events just lately, including a gig that my friend Lisa was playing in, at Kokkino Chorio square. I’ve enjoyed cocktails on the Roof Garden of the Almyrida Residence and attended a charity event in aid of Sara’s Hope Foundation, held at The Retreat, where Emma and Ash’s wedding ceremony took place. A lovely three course meal, all wine included (as much as you could drink!) and entertainment that really was entertaining! Last night was a refreshing change too! I went with a friend to Georgioupoli, where we had dinner in the square followed by cocktails at a nearby hotel afterwards. I feel as though I am slowly catching up with everything and that my feet are slowing down and back on firm ground! 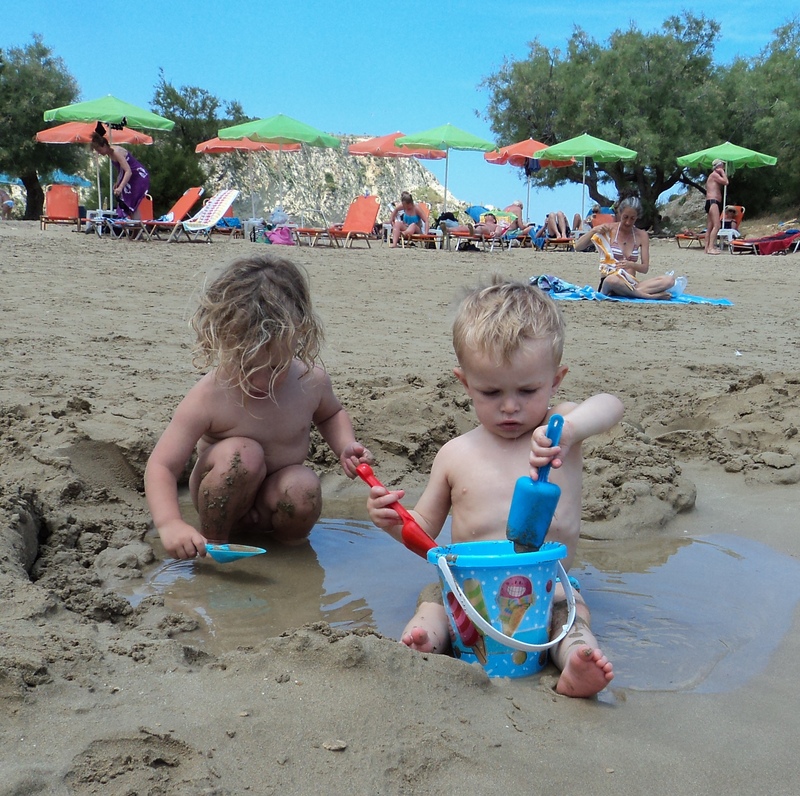 My focus has to be 100% on work for the next five weeks or so – until Karen and Mike arrive for their visit to Crete on 22nd July. Also and most wonderful – Zoe, Emma and Ralph are all coming for another week to Crete in September! In my rich life here on this beautiful island, there is always something to look forward to. This entry was posted in Blog Posts by micmaryjo. Bookmark the permalink.